It's going to be sweet here for a little while. Since most of the food here is Cali-Fusion something, I figure I'll go with the flow and do some Cali-Sephardic dishes for the upcoming new year; adapting, simplifying and lightening some symbolic/traditional foods. I'm a sucker for ritual and Rosh Hashanah happens to serve plenty of it. There are is a substantial list (depending on where you're from) of foods that are traditional to eat to mark the new, complete the old, and remind us to wish for a sweet, plentiful, safe year ahead. These foods may be symbolic because they are sweet, because of their shapes, or because their name sounds like another desirable word. Even though I'm not that superstitious, I feel it can't hurt to make some "lucky" food---and I'm hoping that just setting intentions for the new year will be the catalyst to actualizing goals. So here's my to-do list: Apples, Beets, Black-eyed peas, Challah (round), Dates, Fenugreek maybe, Honey, Leeks, Pomegranate, Pumpkin, Quince...I'm going to try but please forgive me if I don't get through it all. So to kill two or three birds with one stone: beets, apples, and honey. The word for beets (and spinach) sounds like the word for removal--so to eat them is to hope for the removal of adversaries (perhaps figuratively) or obstacles in our path. Every once in a while it feels like the blockade of cars ahead of me parts, my lane clears, and all the lights turn green...but that's a pretty rare thing. Though it's easier said than done, I've tried (with little success) to have a paradigm shift. To think of getting stuck in traffic not as a dare to my blood-pressure, but rather as an opportunity to listen to books on tape or to sing/howl loudly without anyone knowing. I usually end up fuming, counting the seconds that have been wasted from my life, which doesn't help me get anywhere any faster. Perhaps this year I will be better at seeing roadblocks as coming with silver linings. I love beets and have gone through many many recipes. I decided to make up something new with this (more Cali than Sephardic) salad. I figured beets go well with goat cheese, which goes well with lavender, which goes well with honey, which goes well with apples, which are traditional, too. I decided to cut everything into rounds, since round shapes are also customary to represent continuity and completeness. Because of the shape, we were eating them like stacks or sandwiches-- but be reminded that beets are not a finger food (see picture)! The recipe is kind of loose because I just threw it together from what was in the kitchen. Vary it to your taste or sweetness limit. 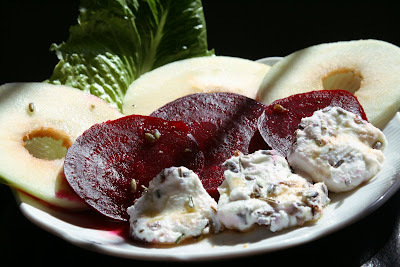 Wrap the beets individually in 2 layers of foil, adding a dab of butter to each packet. Place them on a baking dish and roast the beets at 375° until tender, 30-60 minutes. While the beets are roasting, mash the goat cheese with some lavender and honey, to taste. Shape the mixture into a log by wrapping it in plastic wrap and pressing it into shape. Pop it in the fridge to let it firm a little, to help with slicing. Alternately, you could make little balls and flatten them into rounds. Remove the beets from oven and let cool enough so you can handle them. Then, (I like to wear gloves) rub the skins right off the beets and slice them into rounds. Slice the apples into rounds as well. Then slice the goat cheese log into rounds and arrange everything on a platter, individual plates, or make stacks. Whisk together, oil, lemon juice, vinegar, honey and season as you like. Drizzle and serve! I've gotten a couple questions about availability of lavender...while not as commonly used as rosemary, lavender is just a normal herb and not too tricky to find. Health food stores and specialty grocers tend to carry it. For those in the Palo Alto area, Country Sun on California Ave carries it in their bulk herb section. For the OC folks, Henry's Market in Costa Mesa does too. You can also buy it online, at www.localharvest.org (google "culinary lavender"). You can also grow it yourself or borrow some from your neighbor. I see it in almost every other yard here. One warning--don't buy it at craft stores or anywhere where it looks like it is aimed for potpourri because it might be sprayed with bad things.